Here at Georgia Mountain Cabin Rentals, we prefer to call the owners of our vacation cabins FRIENDS rather than customers, clients, or business partners. We feel that it lays the foundation for a more personal and successful partnership. In order to really understand our FRIENDS and to provide them with the best in Blue Ridge property management services, we generate a customized working relationship personalized to the needs of each individual and their property. It is our goal to create great working and personal level friendships with those people in the area who need property management and vacation rental services. Choosing the right property management company can be difficult, time-consuming, but rewarding all at the same time. At Georgia Mountain Cabin Rentals we want to help educate you about the Blue Ridge property management processes. This starts with a full-service consultation that and phone interview that typically leads to a full on-site property analysis. We can show you the current rental market at a glance, and give you a comparative analysis of how your property would be the most effective. At GMCR we are very hands-on with your property and we are fully accessible by phone and email whenever you need us. Communication is a huge factor in creating great partners and friends; it takes a collaboration between parties to help things run smoothly, be more productive and to maximize your rentals value. It is not just our program or your property that makes a successful rental, it takes trust and a working relationship to help create the lasting memories that guests are looking for. Why Choose Georgia Mountain Cabin Rentals to Manage Your Property? We want to help you maximize your investment property and talk with you personally regarding your Blue Ridge properties. While every property and owner is unique, there are several important factors to consider when making the decision to place your cabin on a rental program. The information listed below will help you make the important decision about which management company will serve you best...we hope you will choose Georgia Mountain Cabin Rentals and we “Thank You” in advance for your interest in learning about us. A professional evaluation is vital to determining whether a property is legally zoned for vacation rental business. Partnering with us also ensures the property will be operated under a proper tax ID and business license, lodging taxes will be collected on any income and remitted appropriately, and that the property meets ongoing inspection requirements. We are also held to a higher standard, we have a State of Georgia Real Estate Broker’s License, are members of Vacation Rental Managers Association (VRMA) which have standards, and many other various licenses to ensure proper and professional management of your vacation rental property. Some of the biggest advantages to partnering with a professional Blue Ridge Mountain Cabin Rental Specialist, are the in-depth programs designed to market our inventory. Our company invests in high-resolution property video/photos, guest surveys, contests, promotional trade outs, brochures and rack cards, advertising, PR and more to drive additional business to our company, thus making each property more income. We typically reach a customer base of thousands with email campaigns, also handling things like search engine optimization, email marketing, social media, online listing sites and other strategies that lead more travelers to book with our properties. In 2015 our website marketing efforts increased site traffic and bookings substantially. We saw a 26% increase in quality traffic to the site and a 35% increase in actual bookings over the previous 2014 year. This provided us with fully booked peak seasons, and large increases of bookings for off-season time frames. Georgia Mountain Cabin Rentals service the property, homeowners, and guests 24 hours a day, seven days a week, with quick and professional responses thanks to fully staffed teams nearby. We commonly handle questions or emergencies after-hours, a time when homeowners may not be able to (or want to) respond. In person, over the phone or online, by check or credit card, our company makes it easier to book vacation rentals in a secure, professional environment. Rental and refund policies are clear, we take security/reservation deposits, and we also absorb credit card fees as a savings to their homeowners. All guests are required to sign detailed rental agreements, and we ensure guests are qualified as families or adult groups over age 25. Georgia Mountain Cabin Rentals can assist with staging and set-up for travelers, including ongoing support with insights and upgrades, and some even offer in-house interior design and property improvement services. Design pros provide detailed plans to meet market demands and make homes more profitable. For example, we can advise on repurposing spaces into game rooms or movie theaters, together with popular "extras,” designs and amenities vacationers look for. From revenues to repairs, homeowner payments to 1099's, homeowners count on monthly accounting of what is happening at their property. 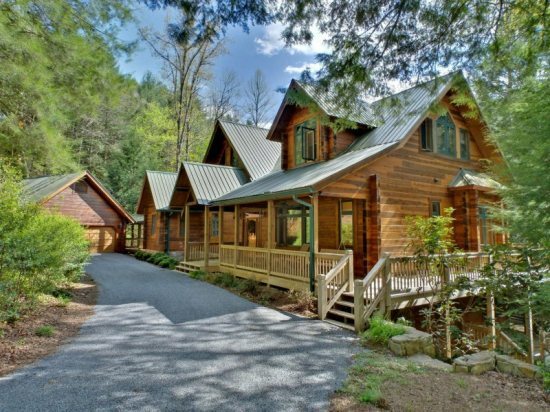 Many Georgia Mountain Cabin Rentals provides online access that allows homeowners to review account information, rentals and revenues, or make reservations on their own, at real time.Contact Us for MORE information about how we can help you with your vacation rental! Please feel free to contact us with any additional questions. We would love to speak with you and discuss your Blue Ridge property management needs. Or simply complete our Property Management Services Homeownerss Request form and we will reach out as soon as possible! Georgia Mountain Cabin Rentals is proud to represent each and every one of our homeowners with integrity and customer service unmatched by anyone else in the Blue Ridge Georgia area. As a result of our diligent efforts for our homeowners (or FRIENDS which we like to call them), we get great feedback and reviews, and we want to share those with those of you who are considering our services. If you need Georgia Mountain property management for your cabin or home rental, please check out our reviews and feel free to call us for more details. It would thrill us to be your one-stop shop for quality property management services in the Blue Ridge, GA area! "I'm thankful to you and the team for making this a financially positive experience, but more importantly for taking such good care of the cabin! For this reason, it's a special place for me and one that you have earned my trust to take care of. Thank You for everything you do. I appreciate the business relationship and friendship." "When Georgia Mountain Cabin Rental took over our property from the previous management company we saw a positive change. Our occupancy rate increased and rental income improved due – in part – to seasonal rental pricing. The website is very functional, user-friendly and has great reporting capabilities. The staff is friendly, knowledgeable and responsive to our questions and concerns. We’re happy to recommend Georgia Mountain Cabin Rental to cabin owners thinking of entering the rental market." "Almost nine years ago, we purchased our cabin from Paul Gribble from Georgia Mountain Cabin Rentals. We also placed it into the rental program at the same time. It was a great decision on our part because the revenue helped pay our mortgage and some months pay all the bills too! We have had very few problems during the past nine years and when there was a problem, Paul and his staff were right there to fix any issues. We appreciate the southern hospitality that Amber exhibits on the phone as our guest call into Georgia Mountain to make a reservation for our cabin. Not only is she sweet and beautiful but extremely friendly and helpful when the guest arrives at the office in Blue Ridge. We feel truly blessed to be a part of the Georgia Mountain family and we look forward to another great year with them! It would be our pleasure to speak with other families wishing to place their cabin with Georgia Mountain Cabin Rental." " Seven years ago I began using Georgia Mountain Cabin Rentals as the company to rent out my second home. Over the years and hundreds of rentals, Georgia Mountain Cabin Rentals has always been there when I needed help with my cabin. My wife and I currently live in Florida and are not able to handle the day to day maintenance and repair of our mountain home, much less able to work with and find vacation renters. Georgia Mountain Cabin Rentals stepped up and has relieved those headaches for us time and time again. The owner and manager Mr. Paul Gribble has assisted us on countless projects and his staff has maintained our cabin to a standard that would be hard to match. As I read the comments from the renters who have used our home for their own vacations or special occasions over the years it becomes very clear that the company does there job extremely well. 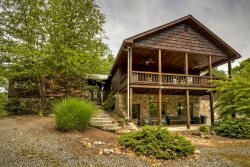 If you’re ever considering using a company for your property management or if you’re just looking for a good place to stay where you can trust that you’re going to get your money’s worth, then I would highly recommend that you seek out Georgia Mountain Cabin Rentals for your future needs. Thank you."